Dr. Cohen’s 23rd year working with the Eagles is shaping up to be a busy one, and not only thanks to the lockout. New rules and practice reagulations, less time with more players, and new medical staff guildlines all put a little more on his plate this time around. Despite the extra work he is loving the preseason and immensely enjoys working with the new players like Steve Smith and Dominic Rogers-Cromartie. Dr. Cohen is excited for the upcoming season and is happy to see injured players like Jamal Jackson and Jeremy Maclin making strides towards full health. Dr. Cohen will be lecturing for the Temple University sports medicine department this fall as well as evaluating athletes from many different sports for alignment and mechanics problems. 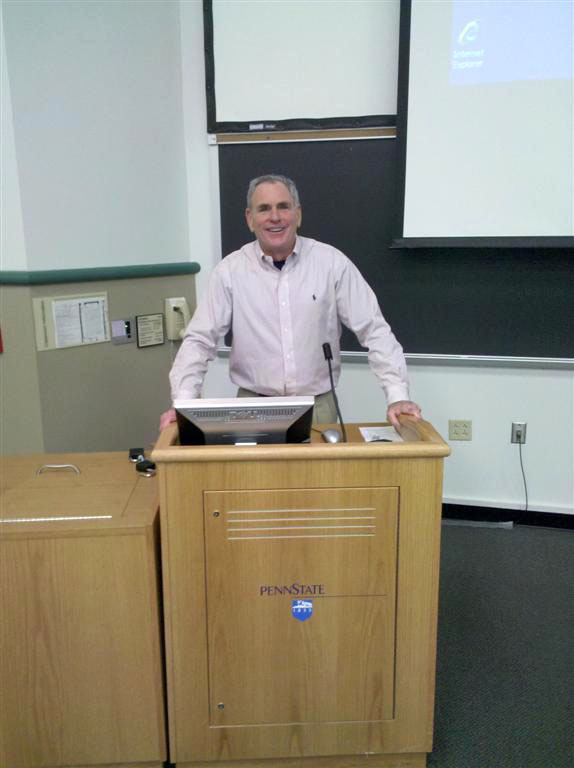 On June 30th Dr. Cohen made his yearly visit to Penn State in College Park, Pennsylvania. While there he examined incoming freshmen from sports such as football, lacrosse, field hockey and more. He used his self-made Cohen index to screen athletes and make sure they could participate in their sport in a safe, injury free manner. After the screening many athletes elected to use a custom insole recommended by Dr. Cohen to correct mechanical issues and prevent possible injuries. Dr. Cohen has been visiting Penn State for a few years now and every year athletes and coaches alike are impressed with his diagnostic skill and with the results of his insoles which now grace the feet of many Penn State athletes. For this and other reasons Dr. Cohen immensely enjoys his visits to Penn State and would like to thanks the coaches, athletes, and the Penn State athletic department for their hospitality. In this video Dr Cohen discusses the importance of Core Strength. This time of year is a bustling time for sports medicine conferences and they have kept Dr Cohen busy. This latest conference dealt with recent advances in the treatment of foot and ankle injuries so we all know Dr Cohen wasted no time getting there. Dr Cohen received the opportunity to trade ideas with the brightest minds in sports medicine at the Constitution center on June 4th. Dr Cohen attends as many sports medicine gatherings as he can. He believes that new ideas on the prevention and treatment of sports injuries are always emerging and enjoys staying on the cutting edge of his field. Dr Cohen was invited to be the keynote speaker at the conference on May 11. This conference is held yearly and attended by local high school athletic trainers. Dr Cohen used the opportunity to educate DC area athletic trainers on common athletic injuries of the lower extremity and how to properly treat them. Dr Cohen screened the entire track and field team of West Chester East High School on Friday, 3/11/11 using the Cohen index. He showed coaches and athletic trainers which athletes were more likely to have injuries occur. He also did running shoe evaluations to help athletes choose the right shoe for them. Dr. Cohen is pleased to announce the support and implementation of physical activity and help initiative for the United States of America. This initiative is sponsored through American College of Sports Medicine and the American Heart Association as well as the College of Podiatric Sports Medicine. The purpose of this initiative is to promote and maintain health in America. The intent is to provide a comprehensive health recommendation for the benefit of physical activity as it is an important part of maintaining health and preventing chronic disease such as diabetes and heart disease. The guidelines and recommendations at this time are for moderate intensity aerobic for a minimum of 30 minutes on a 5 day a week schedule or vigorous intensive physical activity for minimum of 20 minutes on 3 days a week. The overall message how adults are engaging in regular physical activity can promote and maintain health and reduce the risk of chronic disease and premature mortality.Dr. Cohen and his associates plan to help with this initiative by partnering with local health clubs and being able to provide patients with weekly or daily passes to health clubs so that they can start their exercise program under the guidance of personal trainers at the facilities. For more information you can contact the office directly. As a sports podiatrist who specializes in athletes at all levels, Dr Cohen believes in the value of proper biomechanics to prevent injury and improve performance. A coach or personal trainer who instills efficient biomechanics can help an athlete tremendously. Tracy Steven Peal, Sr. is a certified Triathlon, Running, Strength and Conditioning Coach, and Personal Trainer. He has been engaged in the field of individual and group strength and conditioning for more than 15 years. Tracy works directly with many of Dr Cohen’s patients to help them recover from sports-related injury. Tracy holds individual and group sessions to help athletes avoid injury, recover quickly, and handle the stresses of training and competition. To learn more, visit www.tracypealspeed.com, or call 302.753.0220. You can also reach Tracy at tracy@tracypealspeed.com. Check out CBS’s “The Early Show” on Thursday December 21, 2010. Dr. Cohen will be discussing foot and leg exercises to keep you going throughout this holiday season. Dr. Cohen was named Top Doc of the Mainline by Mainline Today Magazine for 2010-2011 for podiatry and sports medicine. Dr. Cohen was one of a few doctors chosen by local practitioners and Mainline Magazine to receive this great honor. Dr. Cohen was invited to attend the Kobe Bryant night at Lower Marion High School where Dr. Cohen is a medical consultant. It is a night dedicated to opening the new gymnasium in Mr. Bryants honor. Kobe Bryant will be present at the event. Dr. Cohen spoke to the Pineland Striders Track Club on sports medicine injuries of the lower extremities on Thursday, December 16, 2010 at the Medford, VFW post. Injury prevention, dealing with pain, and general health and wellness are just some of the topics that Dr Lee Cohen will cover as guest speaker at the Fit-4-Life Seminar being held on Tuesday, November 9 from 7:20 pm to 8:30 pm at Fit-4-Life Cherry Hill, NJ . The seminar is open to anyone 15 years of age or older. The event also benefits the Alexa Nawrocki Pediatric Cancer Foundation. See cherryhillbodyfix.com for details. 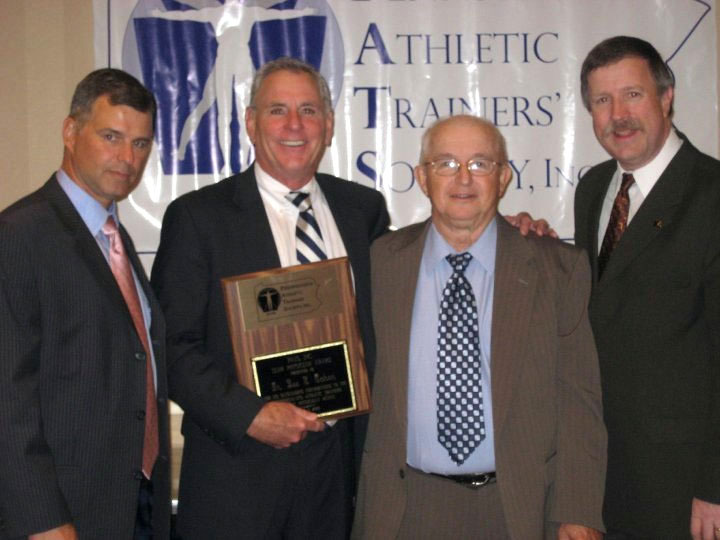 Dr. Lee S. Cohen was named Team Physician of the year by Pennsylvania Athletic Trainers’ Society, Inc. This picture shows Dr Cohen accepting the award. Dr Cohen gave a lecture to sports medicine students at a Penn State University Sports Medicine symnposium, A student took this picture at the lecture. Plantar fasciitis is irritation and swelling of the thick tissue on the bottom of the foot. A common symptom is pain in the bottom of the heel. Athletes develop this condition because of uncorrected foot problems and poor mechanics. Click here to view Dr Cohen’s video about Plantar Fasciitis. Dr Cohen has developed an index that can predict the likelihood of this injury in his patients, and can fix or prevent these problems using custom fitted orthotics. Contact us for details. The Eagles and Sixers have Bulletproof Feet! Click here to read an article about the Sixers and Eagles players using Kevlar insoles from Unequal Technologies. Dr Cohen is mentioned in this article as having endorsed the insoles, which offer “unequaled” protection for the athletes who wear them. Please Note: Voorhees Office has Moved! As of 12/29/2009 we have been seeing patients at our new location — 900 Centennial Blvd, Building II, Suite 203, Voorhees NJ 08043. Less invasive than surgery, shockwave therapy initiates a healing response in the body, resulting in blood vessel formation and more nutrients to the treated area. It is often an option for conditions like plantar fasciitis. Read the press release announcing Dr Cohen’s certification. The Philadelphia Passion in the Lingerie Football League (LFL) has named Dr Lee Cohen their team physician. Information about this exciting new ladies football league can be found at www.lflus.com/phillypassion. Shock absorbing shoe insert technology gives the athlete an edge, says Dr Cohen, in this videofrom Unequal Technologies. Read the KRNV-TV NBC 4 Press Release where Dr. Cohen endorses this new shoe insert technology. Dr Lee Cohen has been appointed to the adjunct clinical faculty at the Temple School of Podiatric Medicine in Philadelphia, where he will teach student doctors . Dr. Lee Cohen was recently invited to an athletic screening of certain Temple University football players. Dr. Cohen visited the university on June 11th and then again on June 15th. Key athletes were examined and evaluated for the use of his PED device. The PED device is a performance enhancement device which helps the athlete function in their maximum efficient position during athletic activities. Dr. Cohen is excited about this invitation because he is an alumnus of Temple University. Dr. Lee Cohen presented a sports medicine program for this athletic training staff at Princeton University on May 6, 2009. The seminar that he conducted was a 3 hour seminar directly related to the evaluation and treatment of athletic injuries of the lower extremity. Dr. Cohen lectured the athletic training staff and then did case studies of specific individual athletes at the University. He has been able to be involved with multiple athletes with treatment and assessment of athletic injury and controlling athletic performance through his PED device. The PED device is a performance enhancement device which helps the athlete function in maximum efficient position during athletic activity. Dr. Cohen instructed the athletic training staff how to examine, mold and accommodate athletes for the PED. The PED device fits in both running shoes and spikes. He has seen resolution of injury in the areas of medial tibial stress syndrome or (shin splints), knee pain, hip pain, back pain and foot pain. Dr. Cohen returns to Princeton University in late summer for further lecture and assessments of athletes. Like the hands of God! I wouldn’t trust my feet with anybody but Dr. Cohen! Mr. Richard Graham has invited Dr. Lee Cohen to organize a medical staff team to provide screenings, medical education and treatment to the soccer athletes that attend and play at YSC Soccer Academy. YSC soccer academy located in Wayne at 224 County Line Road. Dr. Cohen has described activity at the center as a triage type position in which he will coordinate the general medical staff nutrition, athletic training services as well as performance and strengthening services. He will also personally perform biomechanical screenings and testing of the athletes that attend the YSC academy. During these examinations he will provide free information to the athletes and their parents concerning biomechanics and physical structure of their athletes and make recommendations for medical improvements and mechanical improvements. YSC is also expanding their facility. A new turf field is being installed as well as new indoor facility is being constructed. Dr. Lee S. Cohen was recently reappointed as a clinical instructor for primary care sports medicine fellowship of the University of Pennsylvania Health Care System. Dr. Gary Dorsheimer, director of the program has reappointed Dr. Cohen to act as clinical instructor in podiatric services related to sports medicine. This will be Dr. Cohen’s 8th year as a clinical instructor for the sports medicine fellowship. Dr Cohen discusses the recent significant improvements in soccer boot technology. Dr. Lee Cohen was appointed to the medical staff of the Cirque Du Soleil He was appointed to handle injuries of the foot and ankle. On June 30, 2009 Dr. Lee Cohen put in for consultant for Penn State University and will visit the university at state college Pennsylvania. The purpose of his visit will be to initiate his season as the Penn State Football overall consultant to the athletic training department. During that visit, Dr. Cohen will see football athletes, freshman and returning veterans, field hockey, basketball and lacrosse athletes for biomechanical screenings. A biomechanical screening is a postural examination which takes into consideration the athlete’s walk, run, functional relationship, hips, back, leg, knees, ankles and feet. After a biomechanical examination, Dr. Cohen usually will provide a Performance Enhancement Device otherwise known as PED. The PED device fits in the athletes shoe and helps them function in the most efficient athletic position. The PED has been quite helpful in eliminating shin splints, stress reaction, heel pain, knee pain, hip pain and leg pain. Dr. Cohen will most likely evaluate between 25 and 30 athletes during his visit. The athletes are chosen to see Dr. Cohen by the certified athletic training staff headed by Mr. George Salveterra. Dr. Cohen has been named medical advisory board director of sports medicine for Unequal technologies. Dr. Cohen will be responsible for hiring everyone from doctors ,athletic trainers, and medical sports equipment specialists. These specialists will Dr. Lee and Unequal Technologiestrain staff at schools in the proper use of Unequal Technologies new shock suppression gear. This exciting new gear ranges from cushioned footwear to headgear that resists concussions. Dr. Cohen is glad to be affiliated with a company that puts out such quality products. To check out these products visit http://www.unequal.com/. Dr. Cohen delivered a lecture on sports medicine at the Healthplex in Springfield hospital. He will deliver the speech to the sports medicine department and will speak on running injuries as well as the use of custom insoles in minimalist and traditional running. The people at Springfield hospital were happy to hear about the many things Dr. Cohen still picks up on while working with elite athletes. Dr. Cohen Helped Philly Favorite Brandon Duckworth Get Back to Formuckworth, best known in Philly for his outfield accolytes in the Duck Pond, has been struggling with heel pain for the past nine months. This pain has hampered the pitchers career, keeping him in the minors last year. With the help of Unequal Technologies Dr. Cohen fitted Duckworth with a custom Unequal Technologies insole that allowed him to run, train, and pitch pain free just in time for pitchers and catchers camp on Wednesday. Duckworth’s newfound insoles will help him in his attempt to join the Boston Red Sox staff this spring. Good Luck Brandon! Dr. Cohen recently took a trip to Heinz field with Unequal Technologies to fit the Pittsburgh Steelers with their state of the art Kevlar grade shock suppression gear including new helmets, thigh pads, and foot insoles. His next stop around the league is Dallas, Texas to continue helping the NFL keep their athletes safe. Dr. Cohen is thrilled to be working with Pennsylvania based Unequal Technologies as he as plenty of experience recommending their shoes and other foot products to athletes. Unequal Technologies, who recently signed Michael Vick to an endorsement deal, makes quality sports footwear, insoles, and body padding that has been proven to help reduce shock from sports hits. Follow the link to see Heinz Feild pictures from Dr. Cohen’s trip. Due to the NBA lockout many professional basketball players are forced to play in Europe during the upcoming season. Being the team podiatrist for the 76ers has given Dr. Cohen the chance to get to know the players and some have come to his office for a final evaluation before leaving for Germany, France, or Spain. While he enjoys seeing the players he is going to miss being with the team this year.